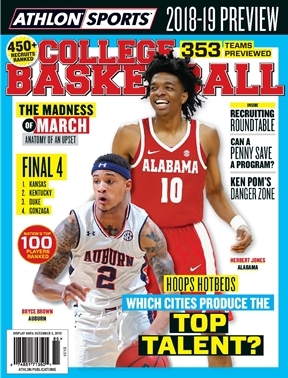 With Midnight Madness just around the corner and another season ready to tip off, the Athlon Sports 2018-19 College Basketball Annual arrives in time to provide the preseason analysis and predictions craved by hoops fans from coast to coast and around the globe. In this year’s magazine, we take an in-depth look at some of the greatest upsets in the history of the NCAA Tournament, including last season’s shocking 16 vs. 1 win by UMBC over Virginia. We also check in on the Memphis Tigers, the once-proud program that is poised for a resurgence under first-year head coach Penny Hardaway, arguably the greatest player in school history. We also determine which cities have been producing the best talent and can legitimately be called Hoops Hotbeds. In addition, we assembled some of the top analysts in the sport for a frank discussion of the recruiting landscape. And for those who love numbers, advanced stats guru Ken Pomeroy tells why the biggest plays in a college basketball game don’t always come at the end of the game. In addition, you can also find exclusive Q&As with three of the game’s top talents — Rui Hachimura (Gonzaga), Clayton Custer (Loyola) and freshman sensation EJ Montgomery (Kentucky). Athlon Sports also provides predictions for the upcoming season — with a complete projected NCAA Tournament bracket — as well as a story on the 10 Things to Watch in 2018-19. This year’s edition includes All-America and All-Conference teams, our ranking of the top 100 players in the nation, 400 ranked high school recruits and previews of all 350-plus Division I teams. Athlon Sports College Basketball Annual is the most complete preview available.